I’ve converted my favorite sausage breakfast casserole into an Instant Pot Breakfast Casserole. 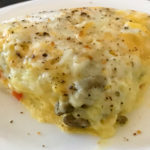 A slice of Instant Pot Breakfast Casserole. I love it so much that we often have breakfast, including our cheesy hash brown casserole for dinner at least once a month! Most of the time I stick with the basics and will fill my plate full of scrambled eggs, sausage and hash browns. On occasion, when there is more time and I don’t mind the carbohydrates, I will make pancakes or French toast for the family. Add in a few slices of bacon that has been drizzled with a tiny bit of maple syrup and I am in heaven! But I have always made Breakfast Casserole for our holiday breakfast meal. By having the entire breakfast in one dish it allows me to sit down and enjoy the meal with my family. I used my 7 inch springform pan for this recipe. Otherwise I have to stand in front of the stove making batches of eggs until everyone gets served. By the time I get around to making my own eggs, the breakfast table is empty. As much as I like breakfast, I cherish the moments that the entire family sits down together for a meal even more! I first decided to make Instant Pot Breakfast Casserole when I realized that the oven was going to be in use all morning. We were cooking a twenty pound turkey and it needed to roast for several hours before serving it at noon. For this recipe I used ground turkey sausage. Obviously taking the turkey out of the oven was not an option. Everyone had their hearts set on Mom’s famous breakfast casserole, and I didn’t want to let anyone down. So of course, I turned to my 6 quart Instant Pot Duo for the rescue. The family chuckled when I brought up this option as they know how much I love my pressure cooker. I use it at least daily, so they weren’t shocked when I decided I could make Instant Pot Breakfast Casserole with it. 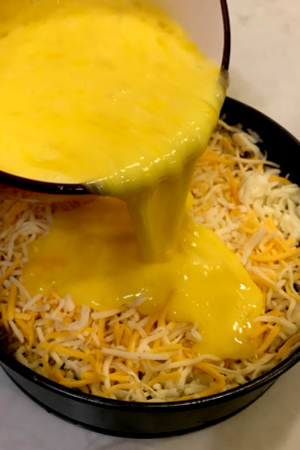 You can pour your eggs before or after you add the cheese. I wasn’t convinced that I could make the egg casserole directly in the liner of the pot. Knowing that pressure cookers require a thin liquid to come to pressure, I was sure that if I tried this method that it would come out a disaster. So instead, I turned to focus my attention on using the Pot-In-Pot method. If you read a lot of recipes that use the Instant Pot, this method is commonly referred to the PIP method. It simply means that you cook your recipe in an oven safe dish and lower it into the Instant Pot. No matter what pan you decide to use, be sure to cover the top with foil. The dish sits on the trivet that came with the pot or one that you purchase. And the thin liquid that is required to bring the pot up to pressure goes in the liner, not in your actual recipe. In order to easily serve my Instant Pot Breakfast Casserole, I decided to use my 7 inch springform pan. I originally purchased it to make Instant Pot Oreo Cheesecake, but have since used it to make lasagna, taco casserole, and more! I like to use the springform pan because it makes serving the casserole a breeze! You can line the inside of your springform pan with parchment paper to prevent any chance of it leaking out of the seal. And as an added precaution, I will sometimes wrap the outside with aluminum foil. Once cooked, just remove the ring and you can slice your Instant Pot Breakfast Casserole like a pie. Once you have removed the casserole from the Instant Pot, run a plastic knife around the edges of the pan before taking it off. This eliminates those requests for an inside or outside piece. Everyone’s piece is the same! And in my house, that is more important than I can tell you! Of course you can use any oven safe casserole dish that will fit down into your Instant Pot for this recipe. Just be sure to use non-stick spray to prevent the eggs from sticking to the bottom and sides. And no matter which pan you choose you will always need to cover the top with foil to prevent excess moisture from dripping on top. The beauty about this recipe is that you can individualize it to your liking. 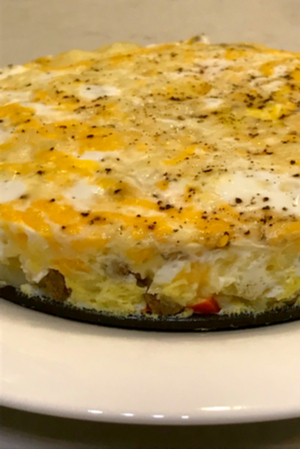 An easy to make, easy to cut way to make Instant Pot Breakfast Casserole. We have included the base recipe, but feel free to doctor it up to however you prefer. 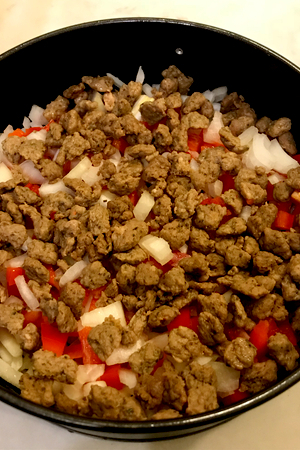 For instance, we use ground turkey sausage when we make our Instant Pot Breakfast Casserole. But instead, you could use traditional pork sausage. Or skip the sausage all together and use bacon or ham. Don’t like onions? No worries – simply eliminate them. 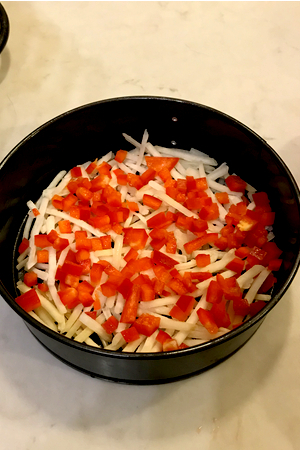 And if you want to make things a little spicier, add some diced jalapeno to the mix. 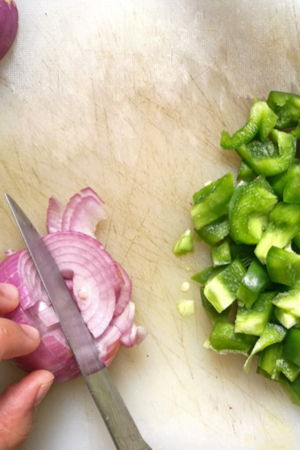 Add any toppings that you would like such as these diced green peppers and red onion. The options are endless. Each time we make it we use the ingredients that we have on hand at the moment. There is one huge and helpful hint when lowering the pan in and out of the Instant Pot. Use a sling. You can purchase a silicone sling that can be used to help you insert and remove the pan onto the trivet. But you can also use a long piece of foil to do the same trick. 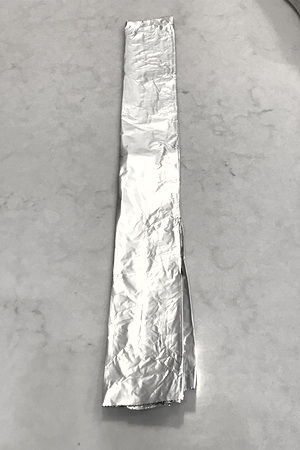 Simply take a 30 inch piece of aluminum foil and fold it lengthwise until you end up with a 1-2 inch wide strip of foil. Simply fold a long piece of foil to make a sling. Put your pan on top of the foil, centered so that both sides are of equal length. Then carefully use this handmade sling to lower your pan onto the trivet. Just fold the ends of the foil over your dish and when it is time to take it out, they are easily accessible. 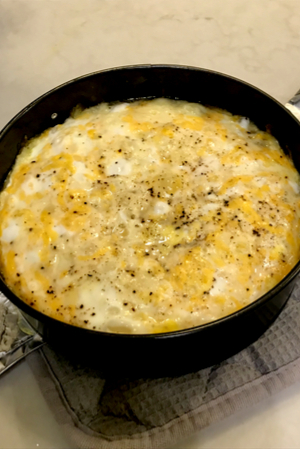 It is so easy to make Instant Pot Breakfast Casserole that we now make one every Sunday evening. We divided the portions and refrigerate them for a fast breakfast meal during the week. 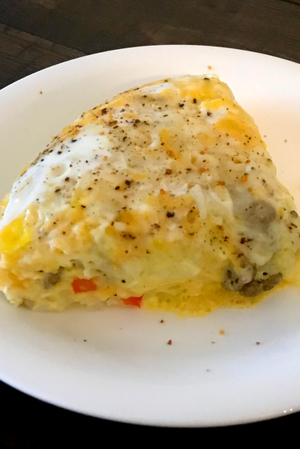 A quick and easy breakfast casserole made with hash browns, sausage, eggs and cheese right in your Instant Pot! Add 1 cup of water and trivet to the liner of Instant Pot. Whisk together eggs with milk and salt and pepper until well combined, set aside. Lightly grease a 7-inch springform pan and add the hash browns. *To prevent any chance of leaking, add parchment paper to the springform pan and foil on the outside edge covering the bottom and half way up the sides of the pan. Add the onions and red peppers over the hash browns. Sprinkle the sausage on top. Pour the egg mixture over top of the sausage. Sprinkle the top with cheese and cover with foil. 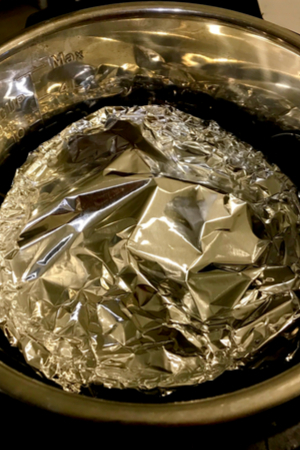 Take a long piece of foil and fold it to make a 1 ½ inch sling to lower the pot in the pressure cooker. Lower the pan to sit on top of the trivet. Pressure Cook/Manual on High Pressure for 20 minutes. Allow for Natural Pressure Release for 10 minutes, then perform a quick release of pressure to release any remaining pressure. Using the sling, carefully pull the pan out. Remove the foil top and carefully run a knife around the edges of the springform pan. Remove the ring of the springform pan, cut and serve. Hi! I’m a new Instant Pot user and wanted to ask – if I doubled this recipe what would that do to the cook time? Thank you! For this recipe it would depend on the dish that you are using. If it is thicker, I would increase the cook time. I would suggest starting off with 5 or 10 minutes and if it isn’t fully cooked, add additional time. Hope that helps!